Combining the ArcGIS platform with industry expertise, Esri partners are contriving innovative ideas that solve complex problems. Discover how the following three Esri partners are harnessing location intelligence, real-time data collection, field mobility, and enterprise GIS to restore access to critical utilities and maintain runways and roads. 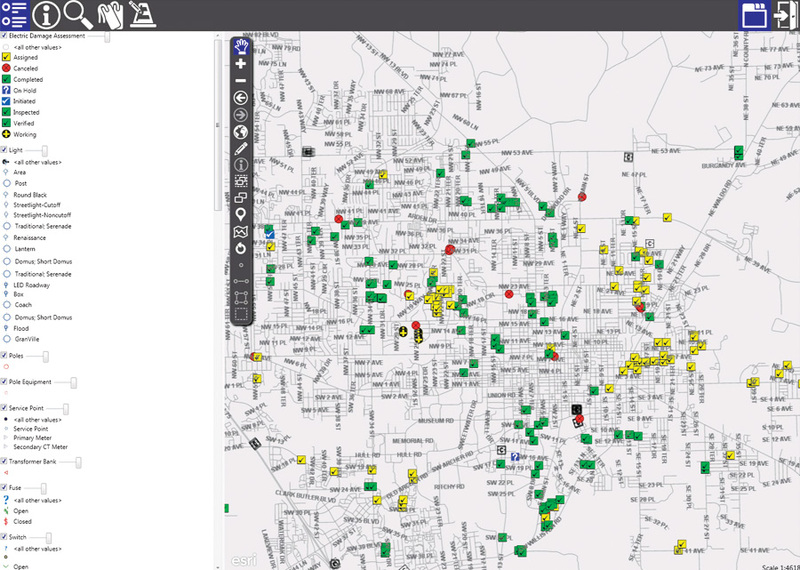 About 60 Gainesville Regional Utilities (GRU) staff members collected information on damages to the electric system and used Operations Dashboard for ArcGIS to broadcast the details in near real time to everyone at the utility. When Hurricane Irma bombarded Gainesville, Florida, with 12 inches of rain and gusts of wind up to 70 miles per hour in September, Gainesville Regional Utilities (GRU) prioritized restoration efforts by swiftly assigning various storm recovery roles to more than 800 of its employees. As a citizen-owned, multiservice utility, GRU had to ensure that its electric, natural gas, water, wastewater, and telecommunications services got back up and running quickly for its more than 93,000 retail and wholesale customers. To do this, GRU used MIMS Mobile, part of TC Technology’s MIMS (mobile information management system) Field solution. 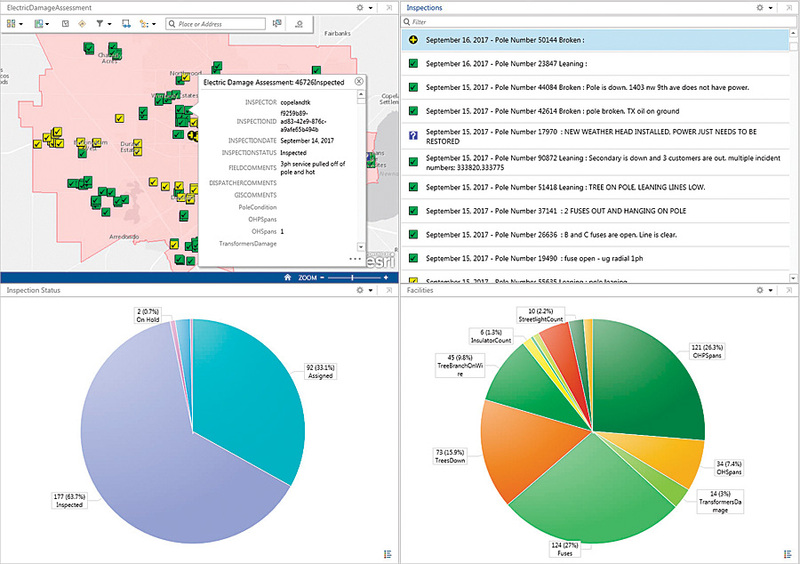 Built with ArcGIS Runtime SDK for .NET, MIMS Field incorporates intuitive maps into forms that have to be filled out, helping organizations streamline both scheduled and unscheduled jobs and unify GIS-based data capture with analysis. Thousands of utility staff members across the United States use the solution to support service and work orders; help with system inspections; and make maintenance, compliance, and asset management processes more efficient. 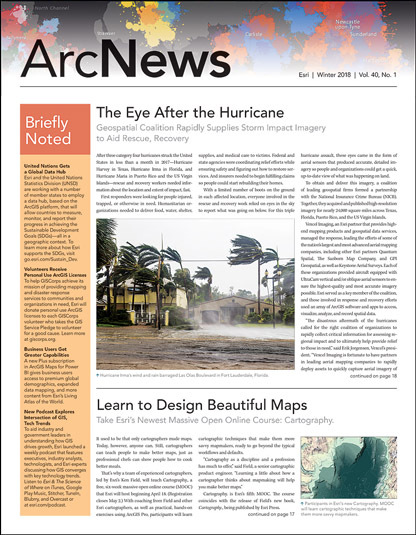 After spending just 30 minutes learning how to use MIMS Mobile, approximately 60 GRU staff members were able to collect and assess information on damages to the electric system, connect directly to the ArcGIS platform, and broadcast the details in near real time to everyone at GRU using ArcGIS Server, ArcGIS web apps, and Operations Dashboard for ArcGIS. With this workflow, GRU restored service for all its customers in just over a week. Additionally, MIMS Mobile allowed GRU to be flexible in the field. Based on feedback from end users, the utility was able to employ the MIMS Configuration tool to make configuration adjustments within minutes. From that, GRU used MIMS Sync to synchronize the configuration changes out in the field in near real time. Thanks to this workflow, GRU restored service to 86 percent of its customers within 48 hours of the storm. And just a week and a day after Hurricane Irma deluged Gainesville, GRU announced that it had restored service for all its customers. Maintenance crews can now record pavement damages as points on a map and include photos. Zürich Airport, the largest international airport in Switzerland, hosted 27.7 million passengers and conducted almost 270,000 flights in 2016. Flughafen Zürich AG owns and operates the airport and is responsible for maintaining runways, taxiways, and service routes. Until recently, Flughafen Zürich used a paper-based workflow to inspect and repair the airport’s 2.5 square kilometers (1 square mile) of road surfaces and more than 50,000 slabs of concrete. The process was inefficient and often yielded outdated data. Flughafen Zürich needed a digital solution that would provide accurate locations of runway and pavement damage, have offline capabilities, be user-friendly, and record data quickly. The company reached out to Geocom Informatik, which implemented GEONIS—a comprehensive framework for integrating GIS into existing corporate systems—along with ArcGIS Enterprise. 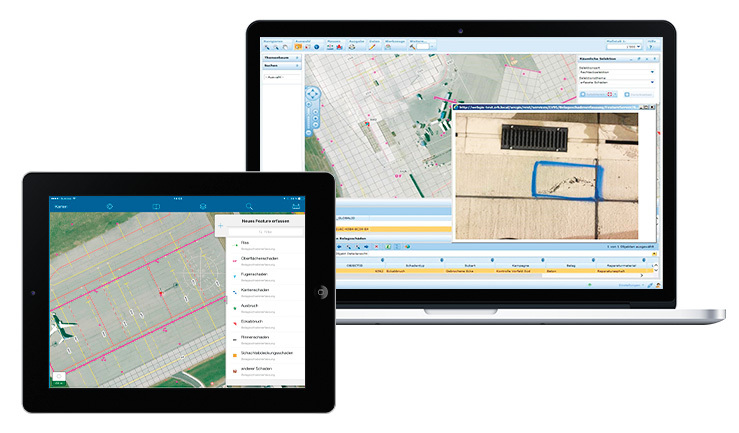 Additionally, Geocom incorporated several mobile capabilities of the ArcGIS platform, including Collector for ArcGIS, which the maintenance division uses out in the field with Trimble R1 Global Navigation Satellite System (GNSS) receivers for its iPads. Now, maintenance crews use their iPads to record pavement damages as points on a map and can include photos with their reports. This field data automatically synchronizes with the rest of the airport’s asset infrastructure data (such as utilities, roads, and signs) in ArcGIS Enterprise. Using WebOffice, an ArcGIS platform-based web app from SynerGIS (Esri’s official distributor in Austria), Flughafen Zürich can quickly prepare the damage reports and evaluations used to authorize construction contracts for renovation. With this new, completely digital workflow, Flughafen Zürich can make its near-constant repairs to runways, taxiways, and service roads much faster. Considering that every project has to be done ASAP—sometimes even in the 30-minute gaps between takeoffs—the company is saving time and money while continuing to guarantee safe flight operations. The Bavarian motorway and road maintenance teams’ map displays weather stations with custom symbology, a chart with weather predictions for specific stations, and routes where dangerous conditions are expected. In the German state of Bavaria, extreme weather conditions make it challenging to perform road maintenance during the winter. To address potential hazards, clear roads quickly, and ensure the safety of drivers and maintenance crews, operational planners on the Bavarian Road Administration’s motorway and road maintenance teams need to be able to react quickly to icy conditions on the state’s network of autobahns. Working with con terra, the teams implemented a near real-time solution that could track the 600 public and 700 private service vehicles they regularly deploy to keep traffic moving along Bavaria’s 22,000 kilometers (13,670 miles) of road. 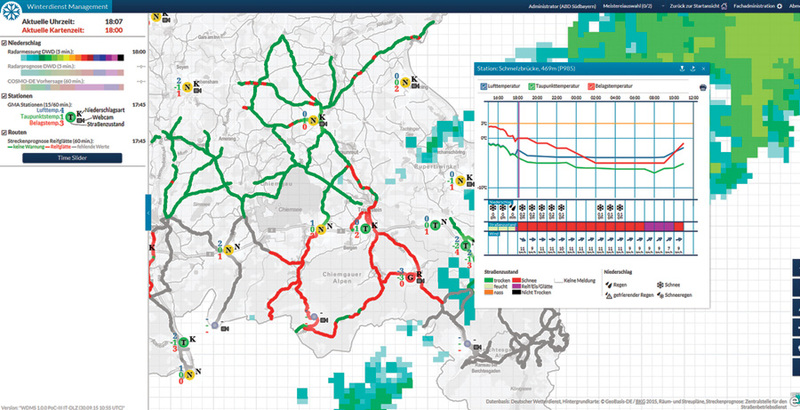 Built with con terra’s map.apps framework—a modular system for creating easy-to-use geoapps—the motorway and road maintenance teams were able to incorporate a range of temporally enabled map services. These include precipitation and forecast data from Germany’s weather service; more than 300 street weather stations across Bavaria that record things like ground and air temperature, street conditions, and ice warnings; and real-time data from the service vehicles out in the field. All these near real-time data inputs now automatically feed into a special alarm and forecast module that warns operations managers which routes are likely to have icy road surfaces within the next 18 hours. This is a massive improvement from the old system, which was only capable of providing two-hour warnings. Now, the Bavarian motorway and road maintenance teams can better plan how to deploy both personnel and resources in the winter season. Being able to coordinate maintenance services proactively not only makes wintertime road maintenance more efficient, but it also has environmental advantages, since the teams can use salt more effectively to keep icy roads safe. Esri’s global partners provide customer-focused, geoenabled solutions that span dozens of industries. Products and services range from configured apps and custom-built solutions to complete ArcGIS system implementations and content. Search and discover partners, solutions, and services that meet your needs.